The NSSL is the first ever StarCraft 2 tournament open to all students (RU & HAN) from Nijmegen! Participating is free, and you are guaranteed to play several games (so no knock-out after your first game). The main goal of the tournament is having fun, so players of all skill levels are invited to join in. You will play your games from your home (or wherever you’ve got an internet connection). At the start of the tournament we’ll send you an e-mail with detailed information about whom to play, and you are asked to plan your own games with your competitors. We’ll make sure that there is enough time to play the games, so that even those with very busy schedules can play in the tournament. The semi-finals and finals will be played live on the 7th of June – see below for more info. If you plan on making it to the finals, be sure to keep this date free! Depending on the number of participants there will be one or two group stages, followed by a single-elimination bracket. In the group stages all the players are randomly divided into groups of about 4 people, and everyone plays a best-of-three match against each of their fellow group members. The top two from each group advance to the next group phase, or to the single-elimination bracket. In the bracket players face off in best-of-three matches, and only the winners go through to the next round. The semi-finals and finals are best-of-five matches (see below for information about the finals). The tournament starts on April 1st and ends on June 7th (which is the date of the finals, see below). The group stages will be held from April 1st to May 15th. In case of two group stages, the deadline for the first group is April 29th. The single-elimination bracket starts on May 15th and ends with the semi-finals and finals on June 7th. Whoever makes it to the finals and wins will be the first Nijmegen Student Champion! Check the Prizes & Awards-page for details about prizes. The main prize will be the honor to be called the first Nijmegen Student StarCraft Champion! Please note that there will be no cash prizes. When will the finals be? 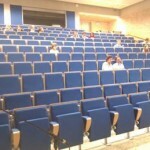 The finals will be held on June the 7th at a live event in lecture hall CC2 on the Radboud University Campus. This will be a real e-sports event! The players will play their games in a separate room at the ‘collegezalencomplex’, and these will be streamed live to a big screen in CC2 where we’ll provide play-by-play commentary of the games. So make sure to come and cheer for your favorite player! The event starts at 19:00h and ends at around 00:00h. Go to ‘Participate‘ to sign up for the tournament! After you fill in the form you should automatically receive a confirmation that you’ve been enrolled in the tournament. Make sure to carefully read the tournament rules, wich contain gameplay rules and specific information about the format of the tournament. If you have any questions after that don’t hesitate to send an e-mail to contact@nssl.nl. Check out our list of participants! These 72 gamers will battle to see who will be the Nijmegen Student StarCraft champion.